It is pretty incredible that they were able to buy back 28% of the shares (or 41% of the the shares not-owned-by-management) without a bigger rise in share Price. When the reporchase was initiated, I planned to sell half of my shares when the price got over 15p. But at least I now own 1/(1-0.28)-1 = 39% more of the Company than before. I sold a bit of my shares when the buyback was announced, but I also now own a larger percentage of the company than before. Thanks for the link, hadn’t seen this news before. Also surprised that Argo hasn’t released anything about this, seems pretty material to me. wow, EUR 100M is quite a lot, but I don’t suppose anyone knows how big the balance of AREOF is, or how much the property was valued at…? In 2013, I believe it was held at 110 m eur or so. There was at least 70m eur debt directly attached to it. [It was 2nd largest asset at that time] In the intervening period, who knows what has been agreed in negotiations with AREOF bankers. There is a strong possibility all proceeds will be taken by AREOFs bankers. However, the sale should improve the visibility by Argos management team of the substantial amounts of management fees owing to ARGO by AREOF, as well as assist in valuing the AREOF stake held by Argo. In addition, the most recent Argo accounts to 31.12.15, in non current assets, contain loans of $1,783k. Of this $1,437k [probably $60k more now with interest] relates to Bel Rom / Sibiu Shopping City. I would now expect this to be cash in Argos balance sheet. Im confused regarding Bel Rome though. Are you saying that Bel Rome is part of the Sibiu Shopping City or are you saying that you expect that Argo is likely to repay the Bel Rome loan to ARGO with some of the the cash it gets from the sale of Sibiu? Sorry Casper, I think Bel Rome is the company or holding entity that holds the Sibiu asset for AREOF. I would have thought that as part of the sale, Bel Rome would be obliged to pay it’s loan back to Argo whether directly or through AREOF. Decent hop up today with half year result. Didn’t have a time to fully read them, on the face of it they look positive. Not sure what happened with Somalian bonds, carrying value vs disposal amount looks strange. Yes, looks like they were carried significantly higher than the price they managed to get for it ($4.8 million carrying value vs just $1.9 million cash received). But overal think it was all pretty good news. 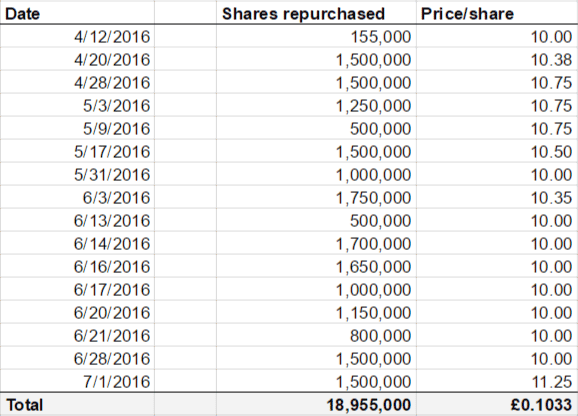 Seems like the share repurchases earlier this year were very well timed. Wonder if they now will continue with the new second program now that the share price is up significantly (think they should, would still add a lot of value). How do you buy this. Can’t seem to do it through IB.